I have said it before, and I will say it again: I love giving gifts. My roommate and I discovered the best website for getting chocolate covered strawberries delivered, and I used it to send a dozen to my BFF for her 19th birthday this past weekend. (It's this site if you're interested... they have so many gifts. I ordered these berries, which I knew to get because my roomie received them from her friend for her birthday a few weeks ago). Jack and I also have been surprising each other with Greetabl's, which absolutely are the cutest little hello note and gift in the mail that you could send someone. I definitely recommend checking out their site! Anyway, Mother's Day is another gift-worthy occasion that is just two weeks away (two weeks from yesterday to be exact) and I am usually way more on top of this than I am this year. I don't know how it crept up on me, but I am at a total loss as to what to get for my mom! Last year for Mother's Day I got her a Lulu yoga top, for her birthday I got her these amazing paisley pajama pants from Anthropologie, and for Christmas I got her a little Valentino shoulder bag (you guys, it was amazing). That said, it was a pretty good year gift-wise and now I want to get her something still fabulous, but a bit smaller. 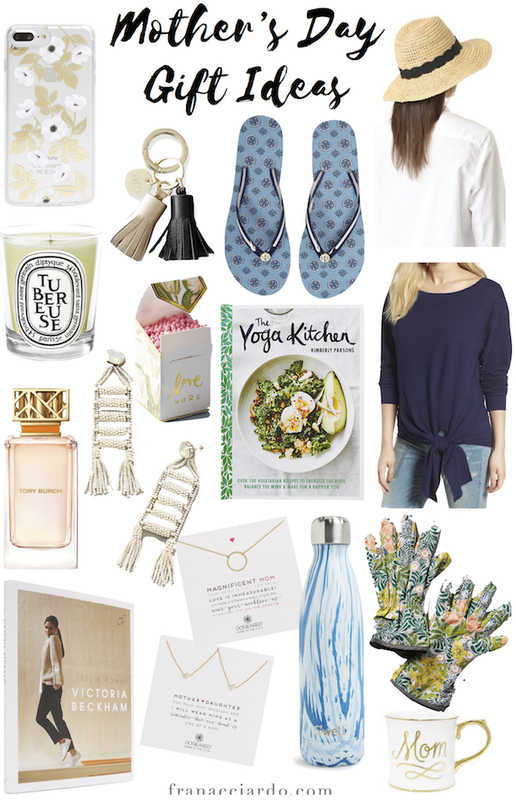 I think I found the perfect thing while curated this gift guide, but I don't want to give anything away in case she reads this post! However, a ton of gifts that I think would be fabulous ideas to give your mom this Mother's Day can be found below. Good luck gifting! // My mom's all-time favorite scent is tuberose! // Everyone can use a fun tassel for their keychain. // Whose mom doesn't love this kind of hat? // Whimsical matches to accompany your mother's candle collection. // Yoga + Cooking, my mom's two favorite hobbies. // A crisp and clean scent for everyday wear. // My roommate and another friend have both gifted their mom's this exact S'Well! What are you doing for Mother's Day? I wish I could be home to actually celebrate! I love Dogeared's necklaces. I should get my mom one for Mother's Day. Love the "Like Mother, Like Daughter" necklaces, those are precious!